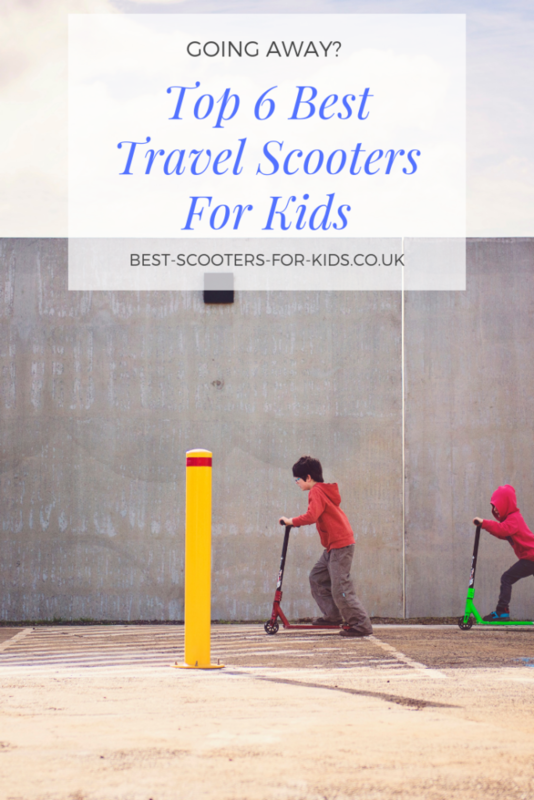 What Is The Best Travel Scooter for Kids? Are you looking to take a lightweight and compact travel scooter for your kids on your travels? Taking a scooter on holiday means that kids who are reluctant to walk can keep up without moaning. They can also be fun for exploring! However, packing a scooter in our luggage can bring challenges. If travelling by airplane, you will have weight limits with your luggage or have a limited amount of luggage you can take on board. If you are travelling by car, a scooter may be hard to fit in the car with all the other bags you are taking. This may put you off taking a scooter along with you. But fear not, there are many scooters that can accommodate for these problems. Wherever you are going the important considerations for a scooter to take on holiday are that it is lightweight so is easy to carry and will fit inside your luggage. It must be able to fold or have an easily removable handlebar so you can fit it in your suitcase or the car. Here are some options of good scooters for travelling with the kids. It's no secret on this website that I love the mini micro scooter and I think you will find most people who make the investment and buy one feel the same. It also makes the best scooter for travelling with young children. Super Lightweight - Probably the most lightweight scooter on the market coming in at 1.5kg. This means it won't add much to your luggage weight which is great if you are flying and don't want to pay extra for luggage. Removeable Handlebar - Although this scooter cannot fold you can very easily remove the handlebar to fit it in your car or your suitcase too. Check out my full review of the scooter. The Mini Micro Deluxe is very similar to the classic scooter above expect it's foldable, it's age range covers 2 to 5 years and it has an adjustable handlebar. The adjustable handlebar and folding mechanism adds just a little bit more weight to the scooter. So it weighs 1.8kg and not 1.5kg like the classic. It has more features than the classic but does costs a little bit more. The t-bar can be removed from the base for easy transportation. Which scooter you get may depend on the age of your child, how much you want to spend and if it's important the scooter can quickly fold and unfold. For older kids, another great lightweight scooter option is the maxi micro scooter. It's a 3 wheel scooter which is designed by the same people who make the mini micro above but it's designed for kids aged 6 to 10 years old. It's super lightweight for a scooter at just 2.2kg so again shouldn't add too much to the weight of your luggage. You can also remove the handle for easy storage and transport. Removable Handlebar - the scooter isn't foldable but the handle can be detached from the base. A folding mechanism adds weight to a scooter which is why to keep the scooter lightweight, micro haven't added one. If you're looking for a lightweight and foldable 2 wheel scooter to take on holiday with you this is a fantastic option. Height adjustable - the handlebar adjusts from 63cm-95cm. Foldable - easily folds and unfolds with a quick release clamp. The handlebars also fold down which means the scooter is more compact to fit in a car on in a large suitcase. Carry strap - it comes with an detachable shoulder strap to make it easy to carry. Another option of 2 wheel scooter for a younger child is the JD Bug Junior scooter which is slightly smaller than the JD Bug street scooter featured above, weighs less and has a slightly younger age recommendation. It's also cheaper so worth considering for younger children. Super light - This is the lightest two wheel scooter featured on the page at just 2.3kg. Smaller footplate - the deck is shorter for a smaller foot. The size is 44cm by 9ccm. See an indepth comparison of the JD Bug Junior vs JD Bug Street. If you're a fan of the micro scooters, the micro sprite is a lightweight two wheel option. It's not quite as light as the jd bug scooters and the sprite is more expensive. However, the micro family of scooters is well known for their high quality so you can be in doubt that this will last for years. 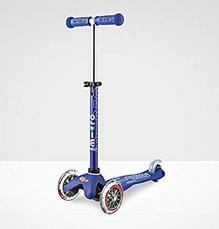 Older kids and teens may request to take a stunt scooter away with them on holiday to use at the skate park. Stunt scooters don't have foldable or removable handlebars so they can be quite difficult to pack away in luggage. If you do want to take a stunt scooter away on your travels, it is best to choose a lighter one so it's easy to carry. Some stunt scooters are lighter than 3.5kg, so these are always a good option. Durable and well built with alloy core 110mm wheels to withstand the impact of jumps and tricks. For beginners and intermediate scooter riders from 8 years plus. There are tons of folding scooters out there. The weights vary from scooter to scooter but it's worth checking out the weights of some and see if they would be an option for you to take with you when you travel. Another idea is to buy a very cheap scooter and have it delivered to the location where you are going so you don't have to travel with it. So if you are going to visit family or friends in the UK, you could consider having it delivered to their house before you arrive.